Education is considered to be one of the biggest treasures in every country. However, its quality and importance is different throughout the world. We have prepared you a list with the best education systems according to Pearson - a British multinational publishing and education company. The criteria of the ranking are the education in primary, secondary and high school, as well as the higher education institutions and international schools. First in the ranking is South Korea, followed by three Asian countries – Japan, Singapore and Hong Kong. On the fifth place is Finland, which was on the first place in the previous ranking. The newest researches are showing the improvement of the Asian education systems in support of this tendency the CEO of Pearson – John Fallon states that the advancement of the education systems strongly reflects on the economic growth of the countries. Where are the European Countries? First comes Finland and the United Kingdom is second among the European countries – as the higher education institution and international schools are strongly increasing its rank. On a global scale, the United Kingdom is sixth, ranked higher than countries such as Germany, France and the United States. A surprise or not, Poland is on 10th place, the reforms in the post-communist country seem to be giving great results. Poland’s education system surpasses countries like Denmark, Germany, Russia, the USA, Australia, Belgium, France, Italy and more. You can get more information about the higher education in some of the above mentioned countries in our Masters abroad section. In this last version of the top 40 ranking the newcomers are the developing big countries – Indonesia, Mexico and Brazil, they are not only advancing in their industry but their educational systems are starting to compete more and more on a global level. If we start looking at the top education systems from the Masters degree point of view, there are some big shifts in the ranking. In 2018 the United Kingdom holds the first place, followed by the United States. Both countries often change places, all depending on the innovations at their higher education institutions. The third place is for Germany and the high quality of its technical universities. The country is one of the top 5 best destinations for international students and it is catching up to rivals on the third and fourth place - France and Australia. The other countries which make it to the top of the list are: China, Switzerland, Austria, The Netherlands, Singapore, Canada, Sweden, France, Spain and Hong Kong. Each university offers an unique study environment, make your research carefully, moreover if you live or study close to some of our fair cities in Europe, you can come and meet with university representatives - all gathered at one place in one day. 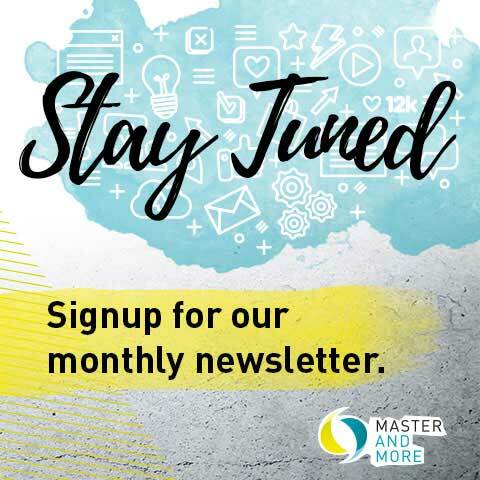 Join the mailing list to be the first to hear about new dates and to get tips and inspiration for your study choice.